Down the Rabbit Hole We Go...: Which Degree Gives You the Most Bang For Your Buck? Which Degree Gives You the Most Bang For Your Buck? I love infographics so much. It's easier to comprehend amounts, statistics and connections when you see them in a picture. 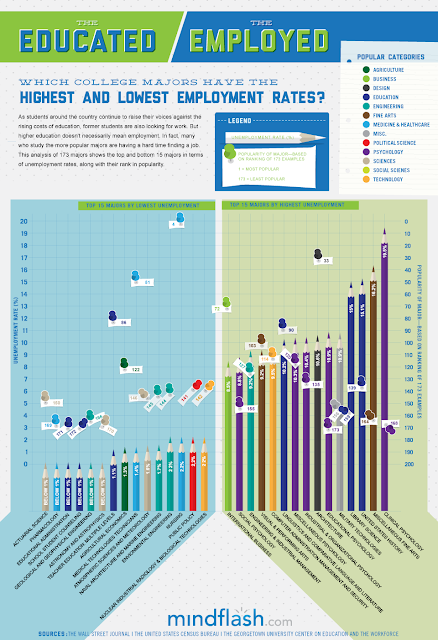 Further to my last post regarding schools, here's some infographics about the most difficult degrees to get and the most profitable degrees to have, as well as the employment rate for those degrees. Click on the graphic to go to the full size original.